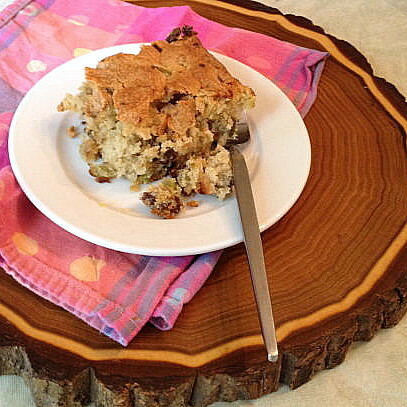 Green Tomato Spice Cake - Get the Good Stuff! Sometimes you just have to wing it. After making pizza, pickles, and chutney, I still had green tomatoes to use. This is a simple spice cake, that ordinarily would be stuffed with nuts and various dried fruit, including citron. I substituted raisins and green tomatoes, and found a new keeper! Green tomato spice cake: if you didn’t tell people what was in there, they’d never guess. Preheat oven to 350˚F and grease a 9×13 baking dish. In a large mixing bowl, beat oil, sugar, eggs, and vanilla until smooth and creamy. Stir together the flour, salt, baking powder, cinnamon, and nutmeg; slowly beat this into the egg mixture and blend well. Stir in pecans, raisins, and tomatoes. Pour into the greased 9×13 pan. Bake at 350˚ one hour, until a wooden pick inserted in the center comes out clean. Cool, then serve directly from the pan.